M. Joanne “Jo” Thornton, 86, of Mt. Pleasant passed away on Tuesday, March 19, 2019, at her home. Joanne was born on February 22, 1933, in Dallas County, Iowa, the daughter of Floyd L. and Alene Clayton Hawbaker. She was united marriage to Lloyd Palar on May 24, 1952 in Dallas Center, Iowa. To this union three sons were born, Kurt, Brooks and Lloyd Jr. The later divorced. In 1979, Joanne was united in marriage to Larry Thornton in Los Vegas, Nevada. 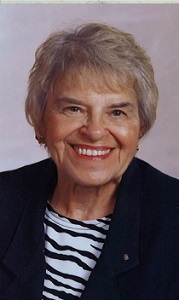 She graduated from Charles City High School in 1950 and then attended nurses training at St. Joseph Mercy College of Nursing in Sioux City and Mason City. She later attended and obtained a degree in Criminal Justice from Iowa Wesleyan College in Mt. Pleasant. She devoted her life to basic social work, education, and care giver of those in need. She was employed by home caring agencies, Planned Parenthood, Case Management of Henry County, and GED tester in more recent years. During her retirement she volunteered as a CASA, MOM’s Group, Stephen Ministry, and Community Action. Joanne is survived by her husband, Larry of Mt. Pleasant, three sons, Kurt Palar and family of Danville, Iowa, Brooks Palar and family of Rock Island, Illinois and Lloyd Palar Jr. and family of Milan, Illinois, and two step-daughters, Rebecca Walker and family of Mt. Pleasant, Iowa and Tamara Drewes and family of Springfield, Illinois, 12 grandchildren and 11 great grandchildren, one brother Gary Hawbaker of Boise, Idaho, and one sister Pam Rausch of Newton, Iowa, along with several nieces and nephews. She was preceded in death by her parents, one brother, Clayton Jay Hawbaker and one sister, Diana Linn Hawbaker. Memorial Services will be held on Monday, March 25, 2019, at 10:30 a.m. at the First United Methodist Church in Mt. Pleasant with Reverend Deborah J. Stowers officiating. Following the service the family will receive friends in the fellowship hall of the church for a time of food and fellowship. Memorials may be directed to the Safe Place Foundation in Cedar Rapids or to Every Step Hospice of Mt. Pleasant in her memory.